A transition mimicking the look of a film reel scrolling into the next shot with customizations altering the frame size, color treatment, and other stylizations. Drag the over your edit in the timeline, placing it at the end, beginning, or between two successive clips. Animation twirls down options controlling how the slide and camera move during the shot. Direction determines if the slide moves Upwards or Downwards during the transition. Strip Length dictates how long of a film strip the animation covers. Animation Curve contains a list of speed presets that determine how the transition is executed. For more information on what these presets mean, visit the Animation Tweening page. Dolly controls how much or little the transition effect is pushed out from. Color Treatment twirls down how the color is affected during the transition. 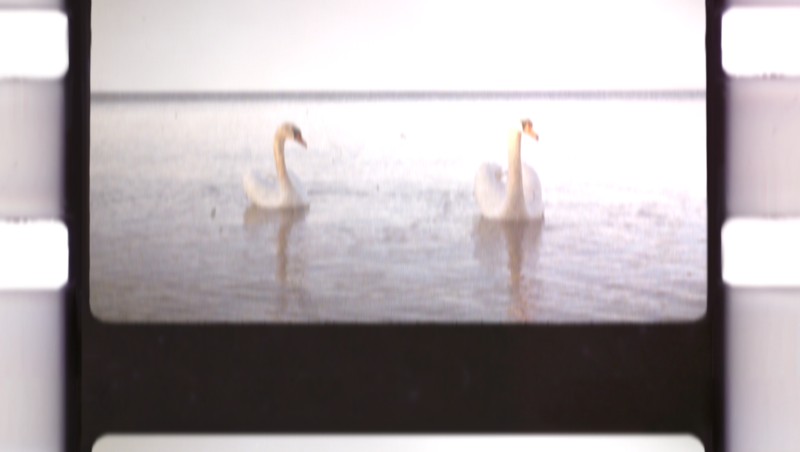 Film Fading adjusts how muted the footage appears on the film strips. Color Process increases or decreases the coloring quantization applied to the footage. Saturation customizes the vibrance of the overall color during the transition. Exposure increases or decreases the brightness or darkness of the overall shot. Blur controls the fuzziness of the footage. Flicker recreates the animated strobe effect of projected film. Higher values may darken your footage slightly. Frame Style mimics the look of either 16mm or 8mm film, with or without their soundtracks present. Frame Size controls whether the frames are the standard sizes of 16:9 or 4:3, or None at all, which will remove the frame borders. Crop to Frame Size toggles whether the footage limits itself within the film strip's borders. Vignette adds subtle darkness to the film edges. Turning the control up increases the vignette effect by adding darkness towards the center of the frame. Turning the control down decreases the vignette by pulling the darkness back from the center. Light Leak contains a list of preset light stylizations affecting the appearance of the artificial light source present during the transition. Light Leak Intensity adjusts the overall brightness of the light leak(s) over the shot. Film Grain controls how much or little artificial grain (noise) is added. Motion Blur customizes an added motion blur present during the movement of the strip across the screen. Background twirls down a couple controls that affect the surface the strip is covering. Color modifies the color of the light using a swatch or eyedropper tool. Opacity controls how blended or apparent the background is.